Made of fiberglass coated with PVC which best suit indoor spaces with vast windows. In rooms where usage of computers are regular, Ecoview works best to reduce the level of glare from windows. At the same time, it allows natural light into the room for occupants comfort. 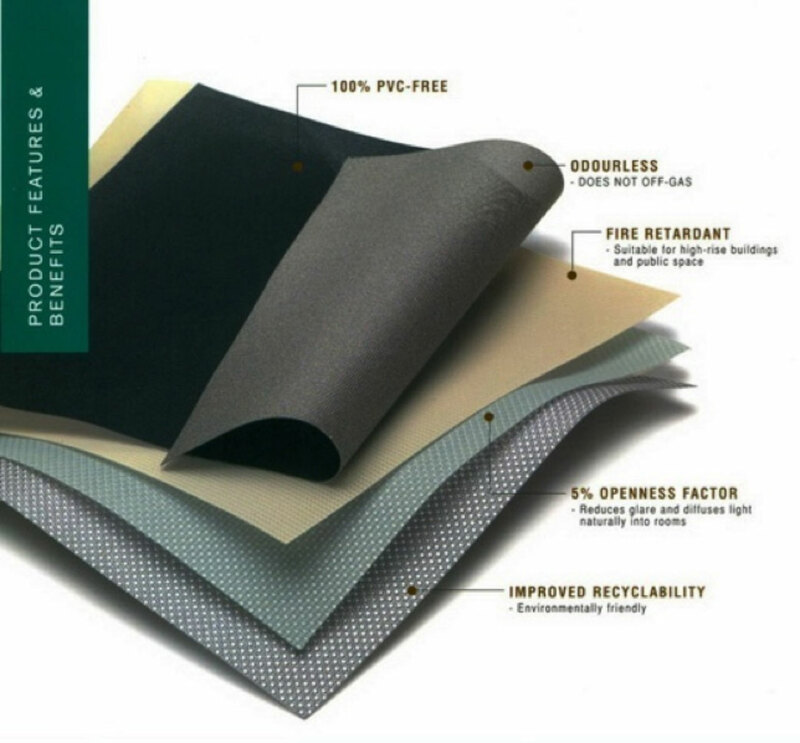 100% PVC free, Greenscreen is an environmental friendly product that can be easily recycled. It does not emit thick amount of smoke when burnt, allowing occupants to make their way to safety during emergency. This eco-friendly range is lightweight with 100% Polyester material, making it suitable for interior shadings. Solutions for both visual and thermal comfort, Helioscreen fabric structure allows in diffuse daylight, while blocking direct sun rays. At the same time provides outside view with its transparency. Made from fiberglass material, Helioscreen limits heat accumulation in interiors by blocking up to 50% of solar light. Internal shading that offers a combination of heat and light control that allows in the right amount of light and blocks away harmful rays and heat. Made of smooth and lightweight materials -PVC Coated Fiberglass which provides good value in both commercial and residential usage. Designed to perform in building exterior, this window shade works best to allow in light but blocks off the heat from the sun. Serge 2165 provides the best quality in Helioscreen range. A new technology in Sunscreen products – Optimascreen™ is made up of polyester coated with PVC, offering more than 50% indoor energy saving and also antibacterial effect against mold and virus. This new innovation in window coverings is safe for usage indoors. One will also be able to enjoy a good view of the outdoors whilst staying protected from the harmful solar heat. The Curtain Boutique is a leading Singapore Curtains & Blinds supplier. We are proud to be an authorised gallery dealer of Hunter Douglas products. Contact us today at enquiry@tcb.com.sg to find out more about the Hunter Douglas range we carry.